Alessandro Araldi was a painter of the Italian Renaissance of whom little is known, but some of his work survives. He was born in Northern Italy in the province of Parma, of which the capital city is regarded for its architecture. Some of Araldi’s contemporaries also born in Parma were Antonio da Correggio and Michelangelo Anselmi. Correggio is often regarded as the foremost painter of the Parma school in the Italian Renaissance and both he and Araldi created frescos for the abbess in the Giovanna da Piacenza. Araldi painted scenes from the story of St. Catherine in 1514 for the Giovanna Piacenza. One, the Dispute before the emperor Maximilian and the other, St. Catherine and St. Jerome. While some similarities can be seen in Araldi’s contemporaries of the Parma school, he was greatly influenced by the early Venetian Renaissance painters. This included Giovanni of the Bellini family of painters and also the Vivarini family of painters. This Venetian School of painters brought more vibrantly colorful tones and a sensuous style to Italian Renaissance painting, which can be seen somewhat in Araldi’s work. Araldi was also influenced by the School of Ferrara painters, especially Lorenzo Costa, born in Ferrara, Italy, but whose influence was great in the Bolognese school of painting. 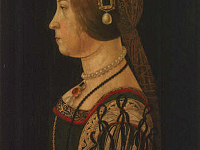 Araldi also painted frescos for a Benedictine Monastery in San Paolo and his portrait piece, Portrait of Barbara Pallavincino (1510s) is displayed at the Uffizi Gallery in Florence.